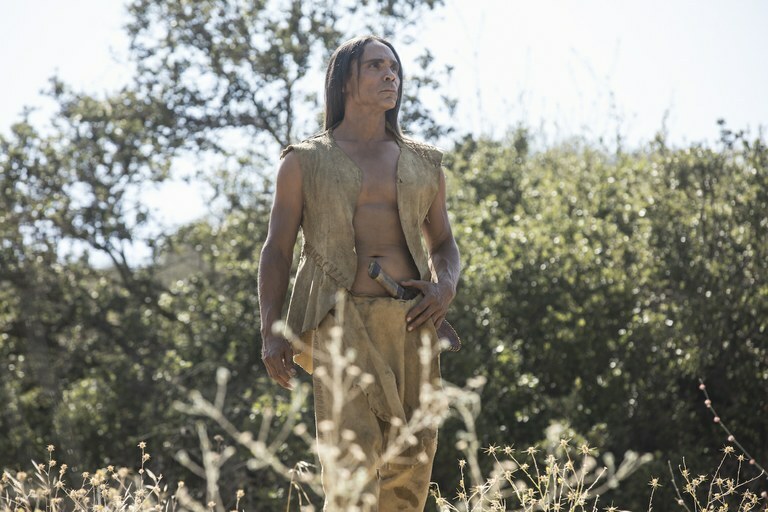 In this week’s episode of HBO’s “Westworld,” Akecheta, a member of the fictitious Ghost Nation, searches for his lost love, whom he recalls from his past life as one of the park’s android “hosts.” As he begins to remember that tranquil life, Akecheta, played by Lakota and Standing Rock Sioux actor Zahn McClarnon, washes away the black and white paint that divides his face, revealing a much more nuanced and human character beneath. “Westworld” is a television series in which a futuristic theme park populated by artificially intelligent hosts goes terribly wrong, as those hosts find self-awareness and start to remember the atrocities wrought upon them by the guests, outsiders from the “real” world. The series is a sophisticated dissection of the Western genre, and as such both relies on and pushes against racial stereotypes. Native Americans have rarely ever been properly represented in popular American culture, an injustice most notably represented by the Western — the stories of which center on the mythologized “Old West” of the 19th century and include outlaws and lawmen, bandits and settlers, cowboys and, of course, “Indians.” While “Westworld” relies heavily on that legacy, it often employs it to say something deeper about race. As the latest episode shows us, sometimes the stereotypes are brought back around to show the audience their inherent fallacy. Most filmmakers want to make authentic stories, Cherokee actor Wes Studi told me earlier this year after the release of “Hostiles,” in which he played a Cheyenne chief. “And many times, it is a matter of them reaching out to those who do know and are willing to accept and work into their stories aspects of Native American life that to us are ordinary ... and either add to or correct some aspect of the film,” Studi said. Sometimes those conversations can be uncomfortable. That dynamic is further complicated when you are an actor hired to convey someone else’s story, he said. But that was not entirely the case for McClarnon. Episode Eight, “Kiksuya,” was largely subtitled, and McClarnon has said not only did the writers ask him to speak Lakota, a language he grew up around, but they insisted on it being as authentic as possible. McClarnon consulted with his mother on pronunciation. McClarnon also noted that for many aspects of the Ghost Nation, true representation wasn’t really the point. Its warriors are made up by the creator of the park, Dr. Ford (Anthony Hopkins). So what are we to make of the series’ treatment of Native Americans, in a place that can simultaneously address stereotypes and render its Indigenous inhabitants invisible? Akecheta is referred to as “The First” at one point, and both the park’s patrons and employees make references to racial myths and a reliance on them. That beautifully spoken Lakota language is meaningless to most of the patrons of “Westworld.” “I never bothered to learn whatever tongue Ford gave you,” one guest, William (Ed Harris) quips in the episode. But, as Bady notes, subtle hints aside, the park itself revels in all aspects of the Western myth, ignoring the troublesome legacies of slavery and genocide. Prior to this episode, Akecheta and his people were hardly more than stereotypical savages, roaming the periphery and committing brutal, almost mystical violence. Yet even when we dive deeper into their world, the only two options Akecheta is given, through his programming as a machine built to play out Ford’s narrative, are that of the simple plainsman or the vicious warrior. These competing and pernicious myths of real life Native Americans also present the “Westworld” writers with yet another chance to turn the narrative on its ear. In the first season, the Ghost Nation is seen terrorizing Maeve (Thandie Newton) and her daughter as they cower in her cabin. But as you learn in the latest episode, Akecheta is not Maeve’s enemy (or a savage at this point), but that he seeks to protect her daughter, who showed him kindness during his quest to find his lost love. By first over-stereotyping the Ghost Nation, and by making them nearly invisible, much like Indigenous people are to this day, the writers then focus on one Native character, giving him complexity and value. This is an opportunity afforded to few Indigenous actors. Just as in politics, comics, or novels, the representation of Native Americans in film has been wrong and damaging, in large part due to a lack of Indigenous input. As Rebecca Nagle recently noted, there has never been a show starring a Native American woman. Netflix even cast a white woman to play a Lakota character in its series, “Unbreakable Kimmy Schmidt,” and that character is getting her own spin-off. “Westworld” need not succumb to such easily avoidable folly, even as it explores the Western genre. Its writers instead might take notes from Netflix’s hit series, “Orange is the New Black,” hailed for its fresh approach to character. If the writers of “Westworld” make more episodes focusing on the ensemble cast, they’ll have even more opportunities to explore new dialogues and narratives about race and identity — and the original inhabitants of the “real” West. Note: This story has been updated to correct the spelling of the Indigenous “Westworld” character’s name. It is Akecheta, not Akechata.